So you have invested the equivalent price of your first car in the dream rifle, you carefully zero’ed the rifle at 100, 200, & 300 yards to get ready for the big hunt and man can you nail it at those distances. You booked the hunting trip of a lifetime, booked the travel, took time off work and planned to blow your mind with the fun that was coming. 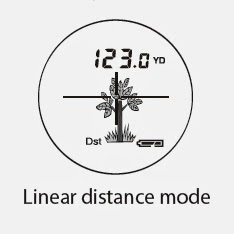 We all invest a lot in getting to the point that we can actually take a shot on the range and/or hunt so it makes sense to actually connect with what we are shooting at and that requires knowing the yardage. For well under $400 you can assure you connect with everything from that squirrel at 15 yards to the steel gong at 800 yards. Nikon’s RifleHunter 1000 has been more than handy investment for me in almost every shooting/hunting situation. Nikon Sport Optics is the same famed camera optics company. Nikon has become fast growing sporting optics manufacturer by delivering outstanding clarity for far less than competitors. In fact I have featured Nikon products in large number of articles because they always deliver the best my builds can deliver from their most affordable optics to the high-end Monarch Gold line. Nikon’s optics are legendary due to their proprietary anti-reflective coatings which offer high-resolution images in most lighting conditions. Over the years Nikon expanded its sport optics line form binoculars, to rifle & field scopes, to now a mighty fine line of rangefinders. Nikon has a range of rangefinder that start at around $150. 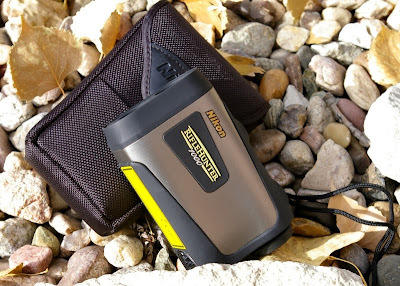 I picked up the RifleHunter 1000 Laser Rangefinder which is just one step down from Nikon’s top of the line Monarch Gold 1200. Nikon’s RifleHunter 1000 Laser Rangefinder is designed to measure distances from 11 to 1000 yards simply in a compact lightweight package. The unit delivers the shot (horizontal) distance based on Nikon’s ID Technology which compensates for incline/decline shooting angles all the way up to a near vertical +/- 89 degrees. If your are shooting down/up a 45 degree incline and the RifleHunter 1000 shows 100-yards then ballistically you should hold zero just as you would for a 100-yard zero. No other adjustment is required - simple. I personally found this especially handy ranging tree rats (squirrels), however the Nikon would also give you the confidence to range and take the shot on that trophy ram way down below you in the gully. The unit can also be set for light of sight (linear) distance as well if you have that need as well as swapping form yards to meters. Operation is simple; look through the 6X monocular eyepiece, press the power button, center your target, press the power button again and about a second later the yardage is displayed in increments of .1 yard/meter out to 999.9 yards and then automatically powers off after 8-seconds… again simple. False readings can even be minimized by using Distant target Priority Mode versus the initial First Target Priority mode setting which delivers faster measurements. Consistency can be a bit iffy on some rangefinders. To test this I headed to my range on different days in different conditions and pulled measurements on known 50, 100, 200, 300, 400, and 500 yard distances. 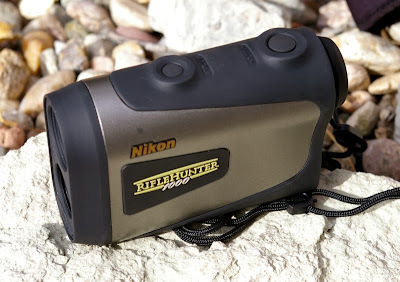 After looking through all the data of six range trips, the Nikon RifleHunter 1000 only varied about half a yard from day to day which is excellent for a $386.95 MSRP rangefinder. As the saying goes, there are hunters who own rangefinders and those that have never tried them before. 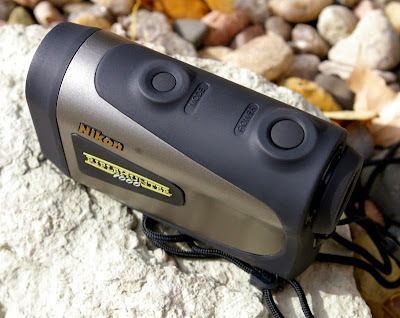 Once you try a rangefinder that is well built and easily to use, you will never hit the range or the trail without one whether you have a pistol, rifle or bow in your hand. I hear they are indispensable for golf as well. I find that I use this tool constantly even just at the range to answer simple questions like was that 100 Meters or 100 Yards or help place target stands for proper 25M AR zeroing. Even more, once you are in the field the Nikon RifleHunter 1000 gives you the confidence to take and make those shots that are within your practiced abilities.